It appears this workstation is having issues connecting to your server. Please verify that the server is turned on and that both the server and the workstation have network connectivity. If you are still unable to connect, log out of Ascend on all workstations before rebooting the server and this workstation. 2. Make sure Ascend is closed. 3. Select the start menu on the computer and type Services. Select Services (or view local services) from the results. 4. 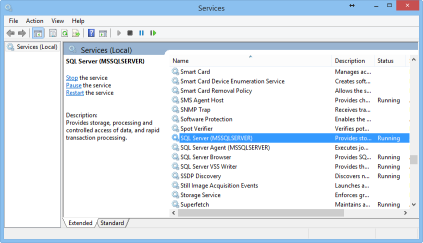 Find SQL Server (MSSQLSERVER) in the list. 5. Check if the status for SQL Server is Running. a. If it's not running, right-click on SQL Server and select Start. it and select Stop. Then right-click again and select Start. 1. Go to the server computer . 2. Click the Start menu. 3. Type System and select System from the results. 4. The computer name displays under Computer name, domain, and qorkgroup settings. Now you can find if the computer that Ascend is not working on can "see" the server computer by pinging it. 1. Go to the computer that Ascend is not working on. 2. Right-click the Start menu on the computer. 3. Select Command Prompt (Admin). 4. Type ping [Server computer name]. 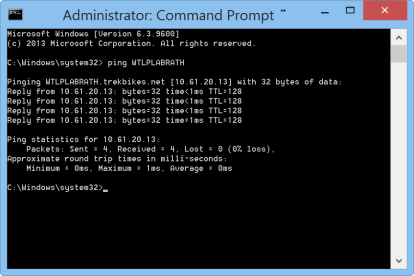 For example: ping SERVER01. If the computer is communicating with the server, you will get a reply saying Reply from [IP address]. For example Reply from 010.020.030.040. Verify your Ascend program on that computer is pointing to the correct computer. It can connect using either the computer name (that you found in System on the server) or the IP address (the numbers in the reply from the server computer). If the computer is not communicating with the server, you will get an error message such as Ping request could not find host SERVER01. This means your computer is not on the network, and needs to be added to the network group in the Network and Sharing Center on the computer. 1. Open the Network and Sharing Center. 2. Select Advanced sharing settings. Check your internet router. Try turning it off and back on, plugging it into a different outlet, and verifying your cables are not damaged or disconnected. Check that computer's Ethernet cable connection - both to the computer and to the router or switch! Disconnect and reconnect the cable, the restartthe computer. If all cables are connected properly and the computer(s) still cannot connect to the network, contact a network or IT specialist in your area for help. We recommend using a wired (Ethernet cable) connection for all your workstation computers since wireless connections are typically less secure and can "drop" your connection more easily.